Do you own one of those gorgeous Erin Condren Teacher Planners but can't fit everything in those tiny boxes? Don't like your handwriting? Used to typing your lesson plans but still want to use your nice teacher planner? This may be the template for you! Included are three templates you can use to type your lesson plans. Simply click in the text box to add your lesson plans. Print the template, cut the text boxes out and then glue or tape into your lesson planner for super neat lesson plans. Directions and examples are included! THIS WILL TAKE SOME TIME FOR YOU TO CUSTOMIZE. However, if you want to love your planner but do not love the idea of writing out your plans OR if you are required to have so much information in your lesson plans that it won’t all fit if you hand write it, then the time to customize this will be worth it. Once you have it set up the way you want, it will be easy to edit each week to do your plans. 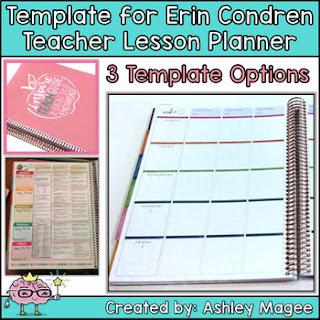 First and foremost, this is for ERIN CONDREN TEACHER LESSON PLANNERS ONLY. If you don’t have an ECTLP then please, this is not for you.